Parish Office Hours (English): Monday through Thursday 8:30am to Noon, 1:00pm to 5:00pm. consecutive classes held on Thursdays at 7:00pm in August, November, February and May. Call Angela Paz, (503) 644-2619, Ext. 174 to register for classes and for more information. conference with a parish priest, at least six months prior to the wedding. Minister to the Sick, Anointing & Neighborhood Welcome: Call Joye Boone, (503) 644-2619, Ext. 170. Grief Support Ministry: Call the Parish Office, 503-644-2619. Funeral Services: Please contact the parish priest before scheduling any funeral services. 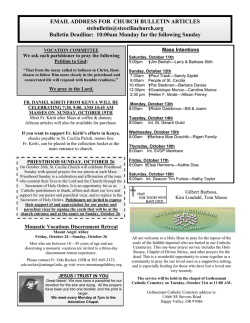 Perpetual Adoration: Chapel is open 24 hours and located in the Parish Center..
Bulletin Deadline: 10:00am Monday for the following Sunday. 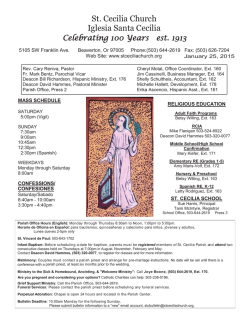 Please submit bulletin information to a “new” email account, stcbulletin@stceciliachurch.org. star, main shepherds and main angels, or three kings. Lottery will be held for these roles. Roles will be divided evenly between School and RE children. You can be Israelites, angels or shepherds, sheep, cow or donkey. We are limited in these supportive roles. If you would like to sing with the choir, please indicate that below. We are limited in the number of children that can be in the choir due to space. WE NEED LEAD PARENT VOLUNTEERS FOR THIS PAGEANT! (Please list your first choice for cast member. If we have too many for one part, we will hold a lottery for that part). sanctuary starting this First Sunday of Advent. should be accorded and reserved to Christ, the Eucharistic King. foster a more prayerful atmosphere. that he can see the main section of the church. Sunday of Advent, when we will also begin a new liturgical year. for your understanding and support to this important change. is a Holy Day of Obligation. Can you donate a turkey for a family in need? parish office. Questions: call 503-643-1702. 1st and 3rd Thursday’s each month. Our Community Partner # 86648. Next meeting is Thursday, December 4th! We will be making Advent Wreaths! Calling All Matthew Kelly Fans! young people engaged. Want to help? Tom (tomdieringer@yahoo.com) for more information! evening’s, 7:30-8:30pm, in the church December 3—Dec.17. Interested? Contact Vicke Hammes at DVJHames@msn.com. Parish Office for $5.00 each. to purchase them after office hours. 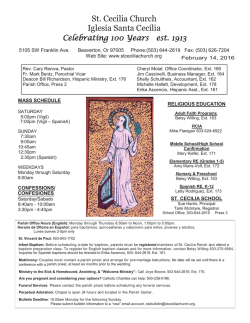 Interested in our Spring/Summer offerings? need to show up and get involved. Fireside Room of the Parish Center. Come be a blessing and be blessed! Loved seeing you at our Advent Family Event!! No class today—enjoy your family!! Dec. 21, 28 NO class—Merry Christmas!!! for 1.5 hours in the Parish Center. Do you know the Bible? Sign up with Mary, TODAY! MAKE THE HOLIDAY’S BRIGHTER FOR THOSE LESS FORTUNATE! Giving Tree Tags will be available on the swag in the church beginning Saturday, November 29th. to read about the organizations who benefit from our Giving Tree generosity! Wrapped, tagged gifts can be returned to the Parish Center the weekend of December 13th & 14th. famous Pumpkin Pancakes and an Eggs Benedict Special! Sunday December 7th, 8:00am to 1:00pm. *Thank you to all who came to the 1st session! 3-4:30pm OR 6-7:30pm in the Parish Center. Next one: December 2nd & December 16th. Sponsors Join at the J anuar y 4thGathering. If your sponsor lives locally, they should join you. It is a potluck breakfast, so let them know. in the NE Room of the Parish Center. ONLY containers labeled Oregon – 5 cent, PLEASE! to Bottle Drop locations in the greater Portland Metro Area. Mary…this would be a HUGE help. Christmas and gift shopping at our table. Knights and support youth ministry. JESUS…. THE GIFT OF THE SEASON! Have you purchased Scrip for your Holiday Shopping? Plus literally hundreds of additional choices! others are prefect for the Giving Tree! Scrip is sold every weekday at the school. bulletin. But we need your help! how many years (12) you’ve been married! Do you have an extra 20 minutes on Sunday morning? The Holidays are coming, lots of visitors arriving. Find a date that suits you, and JOIN OUR TEAM. Be the first to Greet at the Vigil Mass, Saturday at 5:00pm. se hace a la ligera). No queremos perdernos esa experiencia y oportunidad! signo de la luz que viene al mundo. que nos inquietan, y nos trae su paz y un gozo extraordinario. ¿Qué es lo que nos pide? encendidas, para poderlo reconocer y abrir cuando toque. Totalmente Gratis…….para niños y adultos ……. por internet ANTES DEL 1 DE DICIEMBRE. horarios de las partes del programa de preparación. ¿QUÉ IMPORTANCIA TIENE SU SALUD? en la familia y a promover prácticas preventivas. toman en preparación para este sacramento. para darse a conocer y empezar el proceso. de 8:40 a 10 AM, y de 3:30 a 4:30 PM, en inglés y español. del niño) antes de las pláticas. respondido a mi llamado!” 25 de noviembre, 2004. HORA de nuestro trabajo de la semana a nuestro Señor. those living on the margins of our society. test to register for it. at the main and annex entrances to church. Friday, December 5th beginning with Mass at 8:00am. Elder Law Offices of JULIANNE KOCER, P.S. Do You Have Arthritis Knee Pain?